J herbin has just announced a new line of inks, the J Herbin 1798 fountain pen ink. In 1670 J Herbin was a sailor who traveled throughout India. He brought back ingredients for ink and sealing wax and created one of his earliest inks, “La Perle des Encres” (The Jewel of Inks). 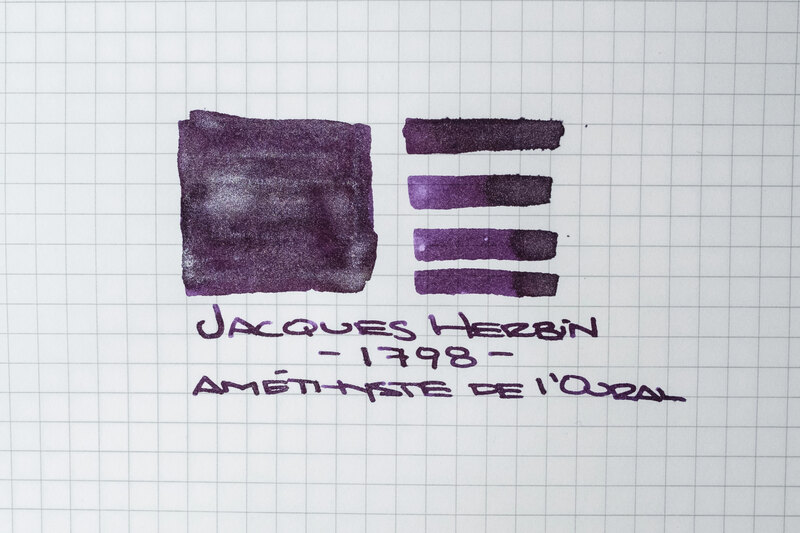 To commemorate this early ink, the J Herbin ink company created the J Herbin 1670 ink line. This ink has been very popular and a huge success. The year 1798, the French Revolution was ending and a new ear began. During this time steel tipped dip pens began to replace the quill pens. Also at this time the J Herbin company relocated to Fossés-Saint-Germain-l’Auxerrois in Paris. 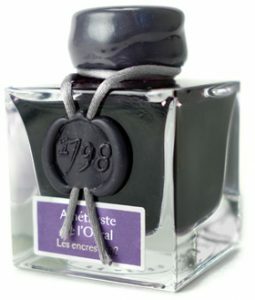 To commemorate the year 1798, a new ink has been announced, the J Herbin 1798 Ink. Similar to the 1670 inks in both depth and viscosity, the 1798 fountain pen ink comes in a glass bottle with a few changes. First the mouth of the jar is larger allowing for easier fountain pen filling. 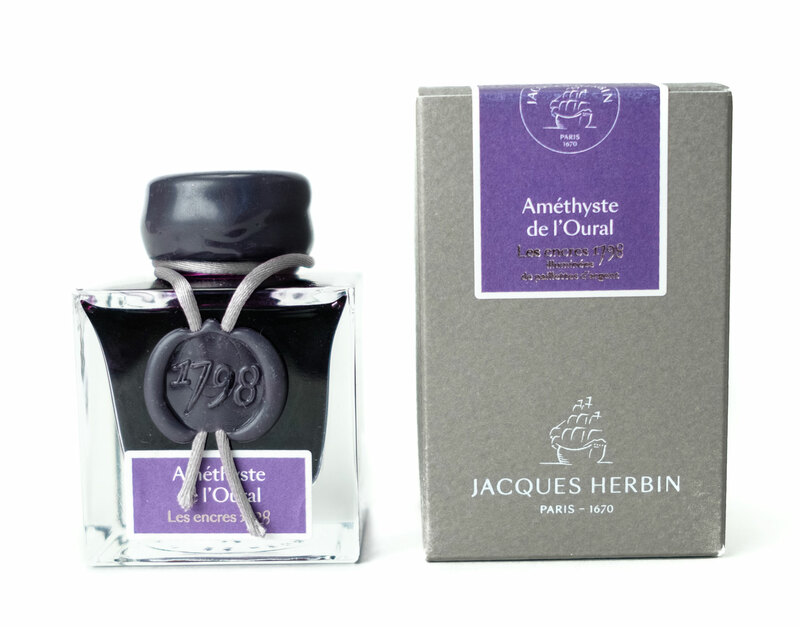 Also the wax top is thicker and the Jacques Herbin logo is engraved on the bottom of the bottle. 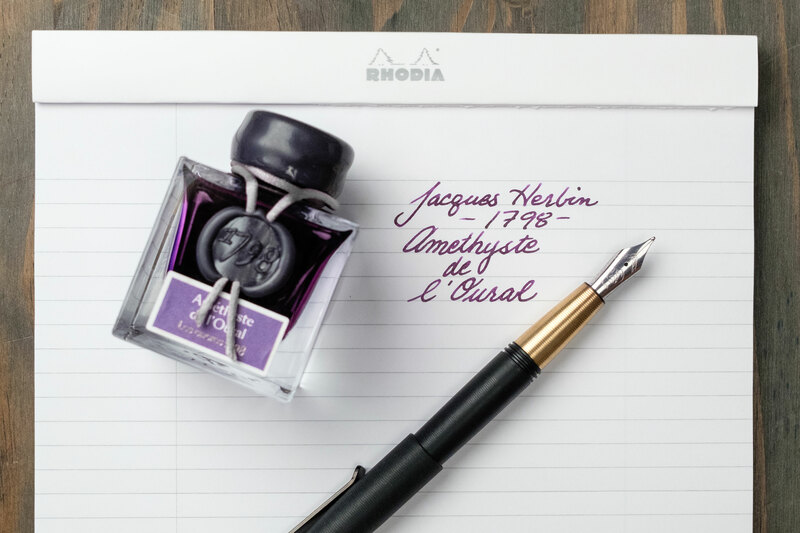 J Herbin will continue to expand this new ink line but their initial color is a deep purple with a silver shimmering effect, Amethyste de l ‘Oural” or Amethyst of the Ural Mountains. The color was inspired by the gemstone trade of the 16th and 17th centuries when amethyst stones were imported from Russia, Brazil and the island of Sri Lanka. The new J Herbin 1798 Fountain Pen Ink Amethyste de l ‘Oural” will be available for on September 1st 2017. Make sure you reserve a bottle today! This entry was posted in Fountain Pen Ink and tagged fountain pen ink, J Herbin, new on August 1, 2017 by Pen Chalet.